After Adrian Padilla, a senior safety with the Oxnard, Cal. high-school football team, suffered a serious concussion during a game last month, he collapsed on the sideline and ultimately required emergency brain surgery. It was a jarring moment for the team, school and community to the point that Principal Eric Riegert said "we will need to think good thoughts for him." Those good thoughts — along with medical advances and treatment — worked. 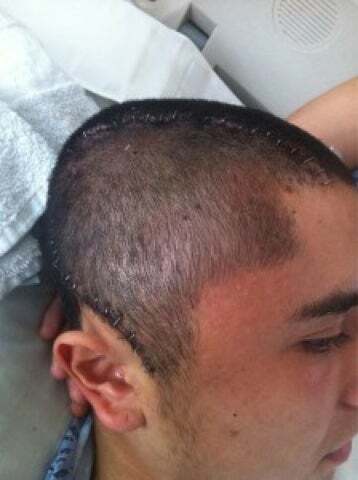 Adrian went home this week with a whole lot of stitches in his head and a whole lot of life in his body. His condition was not made public, but Padilla let his social circle know just how excited he was to get back to Oxnard (even though he admitted the pizza is better in SLO - then again, everything tastes better compared to hospital food!). "I'm going home today! #Fuckyeah #excited," Padilla Tweeted on Tuesday afternoon, his 19th day in the hospital.